This extension is called "Erica". This is from the Mona Lisa Collecton. 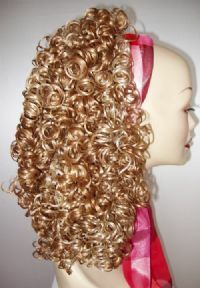 This is a Banana Clip Extension, 16" long, Full, layered, Spiral Curls! There are approx. 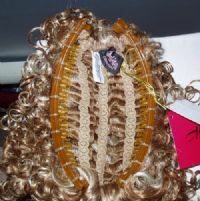 17 rows of wefted hair attached to a 6" banana clip, this is very thick and full! GREAT FOR IRISH STEP DANCING! .. I SELL THESE TO IRISH DANCE STUDIOS ALL OVER THE WORLD AND EVERYONE LOVES THESE! This looks and feels like human hair, but is actually synthetic fiber very easy to care for. This extension is available in the following colors: PLEASE BE SURE TO PUT YOUR COLOR CHOICE IN THE COMMENTS BOX. 1-black, 1B-off black, 2-darkest brown-almost black, 4-dark brown, 6-chestnut brown, 8-light chestnut brown, 10-medium golden brown, 12-light golden reddish brown, 14-light golden brown, 15-golden reddish blonde, 16-honey ash blonde, 19-light strawberry blonde, 22-champagne blonde, 24-light golden blonde, 24B-light butterscotch, 25-golden blonde, 26-medium golden blonde, 27-strawberry blonde, 27A-light auburn, 27C-light ginger, 30-medium auburn, 33-dark auburn, 130-fox red, 613-pale blonde, 18/22-light ash brown and champagne blonde frost, 24/14-light golden blonde and light golden brown frost, 24H613-light golden blonde with pale blonde highlights, (27H613-strawberry blonde with pale blonde highlights -->AS PICTURED), 27CH24B-Butterscotch, 6/30-chestnut brown and medium auburn frost, 8T124- light chestnut brown tipped with light golden blonde, or 8/27-light chestnut brown and strawberry blonde frost. NOTE: I TRY TO KEEP 1 PIECE OF EACH COLOR IN STOCK, BUT THEY SELL VERY FAST AT MY PRICE, SO IF I AM OUT OF STOCK .. PLEASE ALLOW UP TO 2 WEEKS FOR DELIVERY BECAUSE I WILL NEED TO ORDER MORE FROM THE FACTORY!